“Capital growth or cash flow?” It’s the age-old argument for property investors, but the harsh reality is: it’s the wrong argument. If you’ve fallen into this trap and are feeling confused, let me bring some clarity to your strategy. For most people, the road map will be relatively simple — to sustain your quality of life long-term, you need to replace your earned work income with passive investment income. You do this by accumulating high growth, income producing assets and then when you decide to stop or reduce work, you convert your capital to cash flow with ongoing, tax effective income streams. So, the focus is not on “capital growth or cash flow”, it’s growth first, then cash flow. You can execute this strategy with the support of a simple but powerful tool, the income for life — capital growth to cash flow curve. What is the income for life - capital growth to cash flow curve? It’s a tool that helps you determine your current net worth, and what you need to do on your investment income replacement journey to achieve your retirement lifestyle goals. 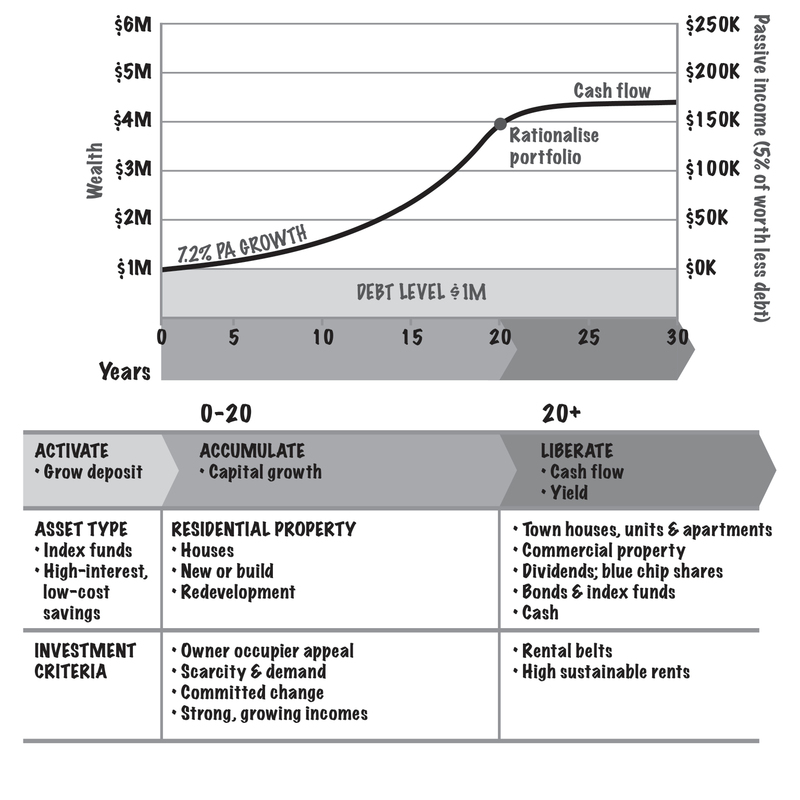 It begins with understanding your position with income producing asset value (your nest egg) on the capital growth to cash flow curve to find out if you need to be focusing on capital growth properties or cash flow properties. If your nest egg is below the level required to create your tax effective passive income level to replace your active work income, you’ll need to focus on capital growth properties. When your net worth hits the level required, you rationalise the investment portfolio and convert to cash flow, focusing on tax effective income assets. Get clear on your ideal retirement lifestyle — What does it look like? Dining out and regular holidays? Spending time and supporting family? With some understanding, you’ll be able to calculate the costs. As a starting point, 80 per cent of your current gross income will maintain your current lifestyle when you retire. For example, if the combined household income is $155,000 then $120,000 is your lifestyle income. How many years away is your ideal retirement date? For our example, let’s say you’re 20 years from stopping work. Based on the assumption of a 5 per cent net return on your income producing investments, apply the income x 20 rule. So, your $120,000 lifestyle income x 20 will deliver you a nest egg number of $2.4 million. This is the number of properties (or income producing assets) required now to reach your nest egg number over your breakfree timeline. In the example we’ve given, you’ll need two properties or $766,000. If your breakfree timeline reduces to ten years, then the freedom number increases to four properties or $1,357,000. Ultimately, the income for life— capital growth to cash flow curve positions you in a place of empowerment, to ensure you reach that lifestyle you’ve always dreamed of — just go for growth and then convert to cash flow. Bushy Martin is an investor and founder of KnowHow Property Finance.